(310) 614-0716 In 2010, Express celebrated their 25th year together, playing anywhere in Southern California that people come together to enjoy music and dance. Because the Express play so many musical styles, they are the ultimate dance band for any event, whether it’s a wedding, anniversary, birthday, or an extra-special dance party. Express is the main attraction at many Oktoberfests, Karnevals, and German club functions throughout the Southland. The Express is known for their musical diversity. Swing, Cajun, American Country (including line dance music), Classic Rock, and Popular Standards are all on the song list. Different dance styles include Swing, Tango, Cha-Cha, Rhumba, Mambo, Lambada and more! Guaranteed to please all ages at your event, Express is your best choice for a party dance band! The Internationals have been together for over 3 decades and perform primarily in and around the San Francisco Bay Area, but have also performed all over the continental US and Europe. The Internationals is a dance band with the ability to play virtually any style or genre of music. The Internationals play "Dance Music from "Everywhere"! My experience includes 10 years with The Variety Band and several years with Tempo and a previous lineup of Carrera. With these groups, I have provided musical entertainment at the Santa Monica German Club, Alpine Village, Old World, The Phoenix Club, Club Edelweiss, Branson, Missouri and other venues. (510) 788-1060 POLKAGEIST WEST is a traditional sounding Polka Band based in the Bay Area. Led by German-born Thomas Seiter on the accordion/vocals, POLKAGEIST West guarantees to have your audience clap their hands, stomp their feet and move their legs on the dance floor. Thomas had a solo act throughout Germany 🇩🇪 and the Bay Area and played in many bands over the years. POLKAGEIST WEST was born in 2016, when Thomas decided to expose his infectious smile and collaborate with like-minded musicians. YouTube Alex Meixner’s performing career began at age 6 with his two sisters and father in an ethnic folk ensemble. From these early experiences through headline appearances at music festivals throughout the US; concert performances with the London Symphony Orchestra, Sandy Duncan and his own jazz and ethnic ensembles; as well as over 50 recordings, Meixner has developed a unique musical mix that appeals to a wide cross-section of audiences. Meixner’s formative musical studies were on piano and piano accordion, but he quickly branched out on drums, diatonic button accordion, bass and trumpet, his college major. This instrumental versatility is combined with a musical background that has included intense studies and performance of jazz, classical, pop, polkas and many ethnic folk music genres with some of the leading artists in the world. His talents in music and comedy were even featured on the Tonight Show on NBC in 2004. Most recently, his “Polka Freak Out” CD with Bubba Hernandez garnered a Grammy nomination in December, 2007. Currently based in Palm City, FL, Alex is performing as a solo artist and with numerous touring ensembles. His solo programs- “Fascinating Rhythms of the World” focus on the fusion of Slavic folk music and Jazz, but also include the inflections of folk, pop and classical styles from Latin America, Africa and other sections of Europe. This music is the basis for a series of multi-cultural music education seminars and performances which are currently available through the Pennsylvania Council on the Arts “Artists in Education” program. Alex also leads The Alex Meixner Band in performances throughout North America. Whether you are looking for sure fire crowd pleasing family entertainment, something for the senior audience, classy jazz for a reception or a unique party band- Alex Meixner will work tirelessly to provide the perfect mix for your event. When Alex is not performing with all of these groups, he is devoted to bringing music to students through educational clinics, as well as his private teaching. Dan Witucki's Heimatland Musikanten Dan Witucki has entertained people all over the world since the 1970’s. Through the 80’s, his band, ‘The Music Masters Orchestra’, played throughout the Midwest and at most of the Polka and German Festivals in the United States. He later was hired by Walt Disney World as the premier concertina player for Epcot’s Germany Show where he performed full-time for 14 years. Dan is known throughout as one of the country’s finest concertina players and is recognized in the Concertina Hall of Fame. Dan’s current band, “Mein Heimatland Musikanten”, is a group of professional musicians including Claude Kashnig on tuba, and his original drummer, Ty Baden. Most of them have performed with many groups including the ‘Oktoberfest Musikanten’ in Epcot’s Germany pavilion. The band uses the tuba to incorporate the classic ‘Oompah’ sound that is sure to get your feet tapping, hands clapping and voice singing to the good ole German drinking songs. They also play many styles of traditional and dance tunes to keep you out on the dance floor. (407) 497-2654 A Dynamic Power Trio performing on Multiple Instruments and Vocals, Covering a very wide variety of music and songs from old German Polkas and sing alongs, to current Country. Accordion (with Midi), Trumpet, Guitar, Violin, Drums and plenty of vocal harmonies can be heard from the group, with a strong groove and passion for what they do!The Europa Band was founded in February 1994, by Hans (John) Kolbrich & Milan Dvorecky in Orlando Florida. The Band has evolved into a nationally acclaimed group with a strong following of fans ages 5-95 from Montana to Miami and California to New York! Their largest performance venue is at the City of Orange, California's International Street Fair that has average attendance of 700,000 people over the 3 day Labor Day Weekend. They have performed to a wonderful and dedicated fan base there for 17 years in a row! The Europa Band has a very active performing schedule of over 60 performances a year including a 35 date Oktoberfest tour, plus many Festivals, Hofbrau Beer Gardens, and Club Events from Orange County, CA to Miami, FL., Hershey PA to Mt. Angle OR. Europa specializes in German music for Oktoberfests & German Mardi Gras (Fasching/Karneval), Czech-Slovak Festivals, and general European Ethnic Club and International Night Events. "Polka Lives" is there Motto, and those that love polkas, young or old, will love the sound of the Accordion, Violin and The Europa Band's eclectic collection of over 350 songs. As one of their fan's was recently quoted saying "You never know what kind of song or style is coming next with this group!" (321) 704-5514 SPITZE! is a German-American Alpine Show Band from Orlando, Florida. The band has been featured at many of the most popular Oktoberfests in the USA. SPITZE! has gathered some of the finest musicians around to provide you with an unmatched, energetic performance that is sure to delight audiences of all ages. Whether you prefer traditional music, modern Alpine Sounds of Europe or even American Favorites - be assured that SPITZE! will make your Oktoberfest a complete success! (847) 464-5207 Oktoberfests, picnics, House parties, Weddings, Anniversaries, Birthdays, Senior Homes, Nursing Homes, Park concerts, private clubs, Corporate Functions, Conventions, School Programs. Whatever the occasion, The Johnny Wagner Band will provide Music and entertainment to fit your event. 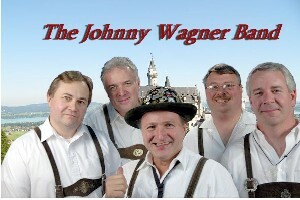 Based out of Chicago, Illinois, The Johnny Wagner Band is a household name in many German speaking communities in the country, specializing in traditional Bavarian, Austrian, and Slovenian styles of Polka Music, and equally versatile to play Rock & Roll, Country, Jazz, and Swing authentically. 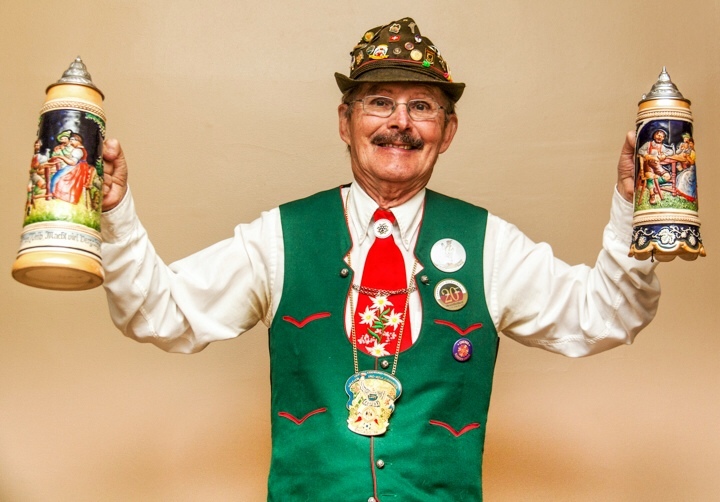 Our shows include Yodeling, performances on the Swiss Alphorn (a 15 foot long horn from the mountains of Switzerland), The Austrian cowbells, and clever audience participation that will have everyone singing, laughing and enjoying the sounds of a good Polka Band. 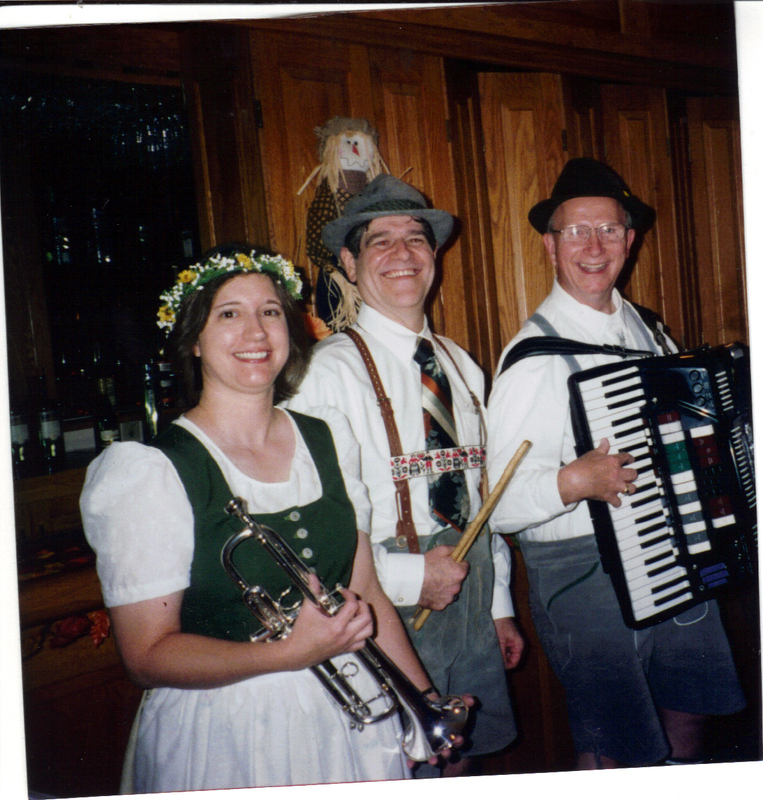 Cell: (630) 269-5299 Since 1995, The Happy Wanderers have been performing German style music at a variety of Oktoberfests, restaurants/pubs, private parties, birthdays, anniversaries, park district events or any other special event. The Happy Wanderers feature traditional polka instrumentation: accordion with male vocal, trumpet and drums. Tuba may also be added. We dress in authentic German lederhosen and dirndl dress. Our repertoire contains more than 5 hours of music, including German, American and Polish polkas, plus drinking songs, waltzes, schottisches, marches, songs from the Sound of Music, plus fun novelties like The Chicken Dance and In Heaven There is No Beer. A fun time for all! (773) 544-7828 Traditional polka and polka type songs played with non traditional instruments (drums, bass, and guitar). A new generation of Polka music. It's fast, furious, and fun. We have electrified polka and made it rock! Local Chicago musicians, Dandy Don Hedeker(of Algebra Suicide & Bouncing Balls), Jumpin' George Kraynak (of New Rob Robbies) and Merry Mike Werner (of Handsome Family) were tired of the dark and dirty woes of the local Chicago alternative scene. Dandy Don (our leader) professed that we would make rock shows fun again. And so the legend began, old Polka bars like the Baby Doll were packed to capacity with angry punk rockers letting their guard down to dance and sing to polka classics like "In Heaven there is no Beer." Audience members were persuaded to come on stage and admit their addiction to the nearly forgotten genre of polka. Every show has been a blast. We are fun, that's it. In 2001, after 4 years of polkaholicism, Merry Mike and Jumpin' George moved on, but Polka Action Jackson Wilson and Jolly James Wallace (Dragon Girls, Apartment)have stepped in to join Dandy Don to keep pushin' the polka! Stylin' Steve Glover took over the 2-beat time keeping in February on '09. The quest continues! The band puts the oomph back in oom-pah and a punk edge on polka. Guitarist 'Dandy Don' Hedeker formed the Polkaholics in '97 by fusing his two main influences: the polka standards of Windy City polka king Lil' Wally and the '70s punk explosion of late guitar god Johnny Thunders (of New York Dolls). What began as a crash-course cover of the traditional 'Beer Barrel Polka' grew into a deep respect for Windy City polka forerunners like The Pala Brothers, The Naturals and Eddie Zima. Punk and polka was an unlikely mixture, but Dandy Don made it work -- and still does with current members drummer 'Stylin' Steve' Glover and bassist 'Jolly James' Wallace. Today, the trio polkas there way into clubs all over the city, and if you ever catch a show, expect proof that the fusion worked: The entire crowd -- young and old, polkameisters and punkers -- bobs with a smile. Two-time Grammy nominee Jimmy's Bavarians is now streaming work-wide on YouTube, CDBaby, iTunes, Amazon, Spotify, and soon, Tidal.Hi-fi. For openers, check out "I Love That Oompah Music." 12 foot Alphorn can be seen on YouTube. Jimmy can be seen in the cameo appearance of the Bavarian musician in the motion picture "The Weatherman" with Nicholas Cage. Show Band, Alphorns, parade unit. 3-7 pieces available for events, public and private, promotions, jingles. Photos, events, information at www.jimmysbavarians.com and Facebook. Jimmy's Bavarians has appeared in the Midwest at Lake Geneva, the Illinois State Fair, the Du Page County Fair, Ho-Chunk Casino, Taste of Chicago, Ravinia, Northwestern University, De Paul University, Illinois State University, and the University of Chicago. The band has also appeared at Chicago's "Music Everywhere", plus the Casino Club, the University Club, Elgin Riverside Club, and the BMW Pro-Am. 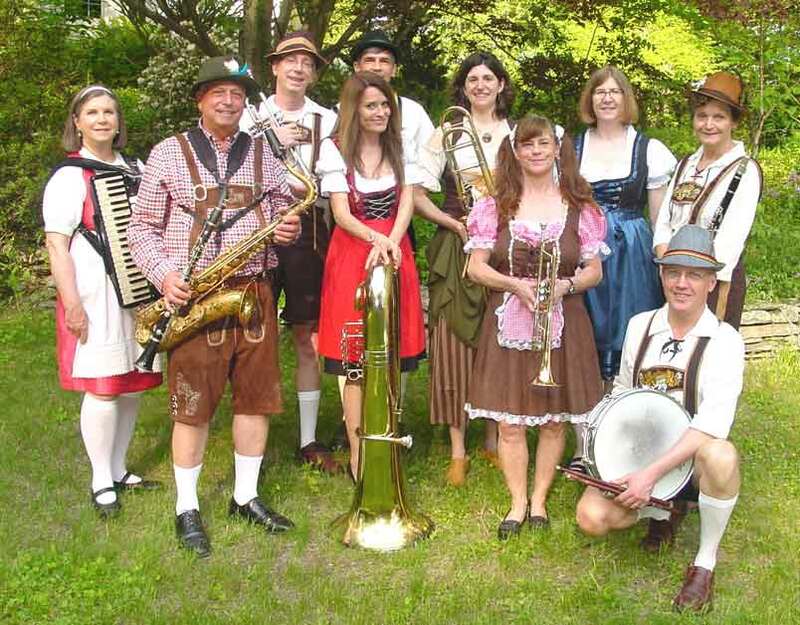 (815) 459-2865 Are you looking for a Chicago or Milwaukee area German Oompah band? Die Musikmeisters German Band is a lively band that performs standard German instrumental and vocal songs in the Chicago and Milwaukee areas. They are also available to travel thoughout the Midwest and United States. 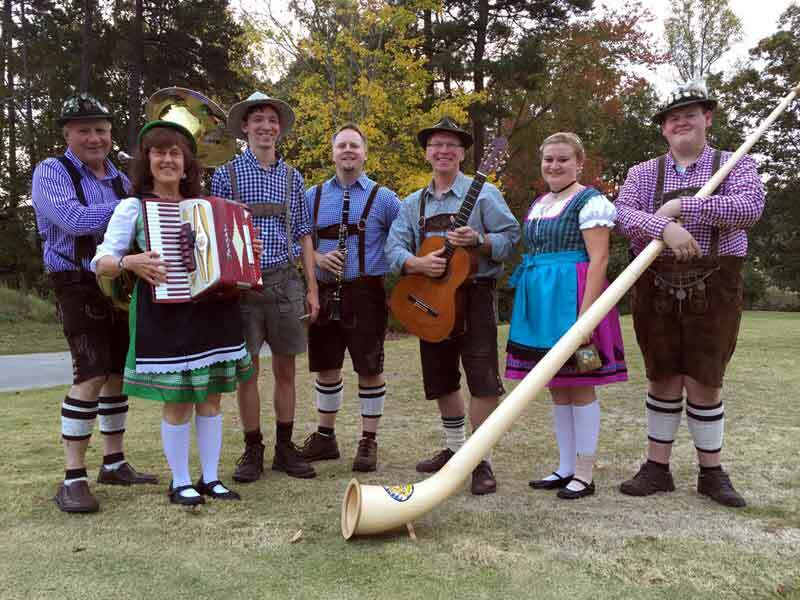 Die Musikmeisters are available for Oktoberfest events and festivals, corporate events, trade shows, senior shows, weddings, anniversary parties, clubs, beer gardens, library concerts, fundraising events, German themed parties and parades. The band is available as a three piece band to an nine piece band, depending on what size band you are interested in. The band provides an entertaining blend of music and showmanship to please audiences of all ages. The band's repertoire includes German polkas, waltzes, marches, dance music, as well as a variety of American favorites. They have over 500 songs in their repertoire. Die Musikmeisters play such favorites as Edelweiss, Liechtensteiner Polka, Du Du Liegst Mir Im Herzen, Die Rauberbraut, Beer Barrel Polka, The Happy Wanderer, Auf Wiedersehn, Ein Prosit, In Munchen Steht Ein Hofbrauhaus, The Schnitzelbank Polka, E-I-E-I-O polka and many more songs. Die Musikmeisters sing in German and English. The band can also incorporate some energetic dixieland and a variety of American music into their performance, if requested. (773) 562-5944 For over thirty years Paloma has entertained at the largest German Festivals, Club parties, and weddings throughout Chicago and the Midwest. A four piece band consisting of native German speakers, with the ability to add other instruments for larger audiences. Our play list is continuously updated, adding the most current German songs. Every show is customized for the occasion including: traditional attire, cowbell performances and yodeling. Paloma performs Waltzes, Polkas, Tangos, Slow Dances, Oldies, Disco, Line Dances (conga and country), Sing-A-Longs and popular audience participation songs from Germany, such as the "Fliegerlied" and "Komm Hol Das Lasso Raus" Ein Prosit!!! mikesurrattmusic@gmail.com The Continentals of Washington, DC was formed in May 1972 and has been under the leadership of Accordionist/Keyboardist Mike Surratt since their humble beginning as a "German" Oom-Pah band. In their 39+ year history the band increased their repertoire incorporating many different ethnic styles of polka and waltz music, plus popular dance hits from the 1940's thru today. Many have tried to label this versatile group of musicians over the years, but most have faced the music that they just have to expect the unexpected at any given Continentals performance. The Continentals certainly have created their own niche in the music world and have performed throughout the USA at Festivals, Dances, Concerts, Radio/TV, and on 9 Cruises to far away destinations. They have also produced 9 recordings and received airplay on more than 400 terrestrial radio stations and countless plays on internet radio broadcasts and websites. The TubaFrau Hofbräu Band is a lively traditional German oompah band that will add festive music to your Oktoberfest celebrations. We also perform concerts, educational presentations and other special events. Our instrumentation is flexible and we can perform as a group of 4-10 players. We perform German, Swiss, Austrian and Bavarian music, such as polkas, waltzes, marches, gallops, schottisches, landlers, and other lively dance music. We also do sing-alongs and feature the Alpine horn in some of our musical selections. Group members are highly skilled professional musicians who perform all over the world with well-known bands and orchestras. Hire us for your special event. Contact us early. September and October fill up quickly. Contact Tommy Schober has been playing professionally since the age of 14. Tommy and his band is known for their very high energy performances. The loose translation of the meaning of Sorgenbrecher is "Breakers of Sorrow" which is something the band does very well. They play the German Rock/Pop music that was played on their radio stations every day, not just for special events on German holidays. Pop music from Germany has never been heard on American radio stations because it's not in English. For the first time, you can rock and dance to the REAL German music that doesn't need green hats, bratwurst, nor lederhosen. If you want to be up and partying, ÜberCool is the show for you. ÜberCool's musicians are professionally trained and educated. Lead vocalist Ashley Mäson has a degree in vocal performance with a focus on German language. The guitar, bass, keyboard, and drummer have toured and performed with theatre shows, big bands, jazz combos, rock bands, orchestras, brass bands, volksmusik bands, polka bands and more. They even slip a little rock accordion into some songs, but they're NOT a Volksmusic/Polka Band: ÜberCool is a rockin' German party band! German music: it's not just for Oktoberfest any more! 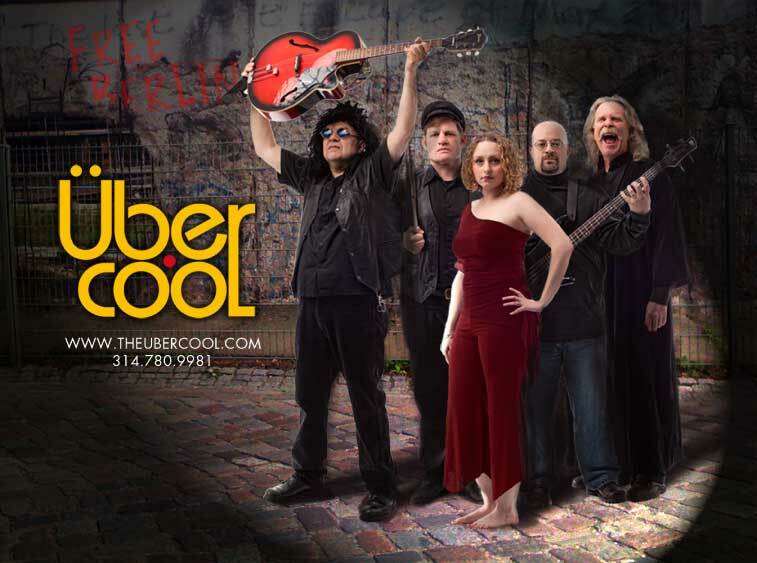 ÜberCool's German heritage brings you great music that is fun to perform and enjoyed by all. Their songs include some you may have heard (Beatles in German), but most are fresh tunes that range in style from Disco to Hard Rock. We'll bring you music from the 60's through today, all German style. (718) 418-3113 For over two decades, die Schlauberger (dSb) has proclaimed "expect the unexpected" Musical proof that entertainers can please just about everyone, dSb is a powerhouse of musical expertise. Performing festival standards to rock and roll meets alpine power; dSb expends enough energy to light up not only the crowd, but the fairground as well. From the moment dSb steps on stage until they have wrung the final note from their last song, the band engages everyone within earshot to join the fun. Their stage show has wowed crowds in venues as varied as the Trump Taj Mahal and Tropicana Casinos in Atlantic City, the Wurstfest in New Braunfels, TX, Oregon’s Mt. Angel Oktoberfest, the Hunter Mountain German Alps Festival, the Cincinnati Oktoberfest, German Fest Milwaukee, Bethlehem Musikfest & NYC Carnegie Hall, to name but a few. They are the only band of their genre to perform a show and sing the American National Anthem to an audience of 50,000 fans at Shea Stadium, the former home of baseball's New York Mets -- and 30,000 + at the former Giants Stadium. dSb has built a fan base competitors envy, making them the veritable “Pied Piper of Festival Aficionados”. The band has incredible appeal to local radio listeners and high exposure to television audiences through their appearances on Home Shopping Network, QVC Network and Fox Network national television. The group also was featured in a 2004 National Network Television Commercial for Hewlett Packard’s iPod. In July of 2005, dSb was involved in a movie shoot for the comedy “Down In The Mouth” with director/actor Kirby Ward. Recording on the Wise Guy Records label, their body of work includes an original song commissioned for the 1994 World Cup Soccer Championships entitled "Fussballfest". The 1997 release, "Play It Loud," has sold thousands of copies, and their third and fourth offerings, "Total Kaos” & “Call It What You Want”, were considered for Grammy Award nominations. Out of 2,400 CDs in 28 categories the “Total Kaos” album was nominated for the 2001 JP Folk Music Awards, and on three separate occasions it has topped international music charts for sales in America. Their CD release in 2007, “Live 'N' Kickin'”, captures all the best of dSb concert moments from their hugely successful 2006 tour and “dSb Live”, released in 2004 recreated the band’s potent presence on stage. 2010 brought dSb the Pace Award for Best Variety CD for their release “Looking Back”. As the title suggests, “Looking Back” is a retrospective of die Schlauberger and the music the band performed in its early days but with a modern twist. To commemorate dSb’s twenty years of performing, the band filmed concert footage during their hugely successful 2009 Alpine Thunder Tour. The DVD combines footage of the band's live performances and candid interviews. This glimpse of life on the road with the USA's Premier German Festival Band captures the high-octane entertainment of dSb in concert. The Holzhackern Tyrolean Band The Holzhackern Oktoberfest sound is built around high-energy arrangements of the traditional Bavarian songs, always with a full three-piece horn line --- trumpet, tenor sax, and trombone. Shows include English and German vocals, audience participation dancing and sing-along, plus lots of very danceable international music. We picked up the style of leading Oktoberfest bands from Frankenmuth, Allentown, Milwaukee, and Helen, and first appeared as the Holzhackern for a 1983 New Year's Eve party at Veronika's German Restaurant in Winston-Salem. Over the past 26 years, we have performed for German-American clubs (Winston-Salem, Augusta, Charlotte, Clarksville, Spartanburg, Fayetteville), at civic Oktoberfests and Sommerfests (Columbus Ohio German Village, Savannah Riverfront, Augusta River Walk, Charlotte, Hickory, Raleigh, Myrtle Beach, Winston-Salem, Cookeville, Statesville, Ft. Bragg, Greer), at resorts and German restaurants (Grove Park Inn, The Homestead, Helen Festhalle, Weeping Radish, Waldhorn), and at private clubs throughout the Southeast. On those rare occasions when someone shows up at our Oktoberfest and really doesn't know the Chicken Dance, nor when to shout "Hoi, Hoi, Hoi! ", nor what to do as the first or last person on a polonaise line…well, our vocalist and Gemutlichkeit-specialist, Heidi, conducts a short training session in proper "Stimmung Im Zelt" behavior. An old-fashioned MarschWalzer is held every performance, and we're still trying to best the record set at Spartanburg during the late 1980s --- over 100 couples filled the dance floor! 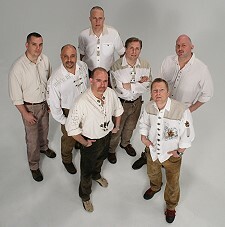 The Mountain Top Polka Band (MTP) provides musical entertainment and German Oktoberfest atmosphere since 2009. 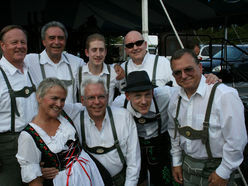 As a Southeast German band, MTP performs at Oktoberfests and year-round at festivals, parties, corporate events, and restaurants in and North and South Carolina, Tennessee, Georgia, and Virginia. The Mountain Top Polka Band is dedicated to having fun while promoting Bavarian and German music and dance. Our library contains marches, polkas, waltzes, and more with over 100 compositions guaranteed to get your feet moving. Contact us for more information. The band consists of Tuba, Accordions, Clarinet, Drums, Singers, Dancers, and more! YouTube The Chardon Polka Band is known for being innovative and extremely adaptive with the ability to please almost any audience; whether it be 20-somethings at a college hang-out, or the patrons of a local senior center. In their nine years together, the band has made a mark for itself by adding a colorful twist to the traditional genre of the polka. The Chardon Polka Band has made a name for itself in the Cleveland area by playing some of the area’s top festivals and fairs, bars and pubs, and other musical venues. During the fall season, the band is extremely busy entertaining at many of most popular Oktoberfest events across Ohio! In years past, the band has entertained at events including The Taste of Cleveland, The Great American Rib Cook-Off, The Avon Duct Tape Festival, Twinsburg Twins Days, Tony Petkovsek’s Thanksgiving Polka Weekend, The Columbus Oktoberfest, and the Berea Oktoberfest. The Chardon Polka Band has been known to get rowdy at such venues as The Beachland Ballroom, The Grog Shop, The Happy Dog Saloon, and The Chardon Brewworks. The Chardon Polka Band is happy to take part in continuing the Cleveland polka tradtion while adding their own unique edge and antics to the genre. YouTube Whether it's toe-tapping polkas for an Oktoberfest, Big Band Swing, or a Caribbean Party atmosphere, the FKO Big Band, also known as the Klaberheads (during German season), is the band that will fill the bill. Our orchestra is known in the mid-western states as a consistent crowd pleaser. It's a reputation that my grandfather, a German immigrant, began building when he founded the orchestra 82 years ago. And, it's one that has earned us invitations to perform at the Epcot Center, at Munich's popular Hofbrauhaus in Kentucky, and many other venues. We especially enjoy playing yearly at the major Oktoberfests in the midwest, including Cincinnati and Columbus, Ohio. These annual invitations are, I believe, because of our top musicianship and the ability to achieve a high-energy connection with the audience. In August, September and October, you will find the Klaberheads at your nearest Oktoberfest beer tent, leading the charge in fun. But the rest of the year, the FKO takes on a completely different musical appearance and make up. The FKO Big Band performs at all types of venues from conventions, summer concert series, wedding receptions, parties and dances, and plays tunes from a wide variety of musical genres that brings fun and enjoyment to all ages. Versatility. That's what makes these talented musicians the band that's in demand. So, whether you need a fun German Band (that isn't your typical Grandma's oompah leatherpants-type-band that puts you to sleep in 5 minutes) or a swing band that rocks, or a band that brings a party atmosphere (whether it's Jimmy Buffet style of just plain "let's have a party with a band"), the Klaverheads are your answer - they are the band for all seasons! That's what makes these talented musicians the band that's been in demand since 1930. Route 161 Happy Wanderers Polka Combo The Route 161 Happy Wanderers have an evening's worth of crowd-pleasing music ready for your next event! In addition to polkas and waltzes from all over the world, we offer a wide range of music, such as Cajun two-steps, Klezmer, Musett, Enka, Forro, Pop/Folk and sing-alongs for all occasions. (937) 537-1282 We are `Ken and Mary Turbo Accordions Express` performing as a duo, 3 or 4 pcs band in authentic costumes and sound. We have performed thru out the mid west USA as well as in El Salvador, Central America for the Miller brewing Co. Oktoberfest 2013 & 2014. We will travel to your event. Have full sound system and 50 years experience . Call us for your next event. 972-979-3074 Oktoberfest season is almost here, which means the AlpenMusikanten, your favorite AND ultimate party band for every occasion will be very busy performing every week at a festival near you. To find out where you can hear and see us, visit our Schedule page, or get on our mailing list and we will let you know when we are performing at a festival near you. We are looking forward to seeing you! (210) 378-6549 Robert Atwood, Accordion–One of the country’s finest accordionists, Robert displays a command of the instrument that is rarely found, anywhere. His series of CDs, titled “This Old Accordion,” is both entertaining, and musically impressive. Robert has performed across the U.S.
Kevin Hatcher, Vocals & Autoharp–A former national yodeling champion, Kevin knows more songs than some people have ever heard, and sings songs in several languages. Kevin is also a veteran of Disney theme parks. As leader of the band Bergvagabunden, he became a part of the polka history of the state of Texas. Ray Grim, Tuba––Ray is a former school band director who really never quit playing his horn. Ray also performs with the talented group known as The TubaMeisters, as well as with the prestigious San Antonio Wind Symphony. Suellen Grim, Clarinet–Suellen is the newest member of Eurofest, and a brand new polka musician. She plays with a sweet clarinet sound, and brings a new dimension to the group. Eric Miculka, Drums–Eric is the youngster of the group. He provides a solid rhythmic foundation for the group. Eric can occasionally be found performing with rock or country bands, as well. (830) 606-0011 The Alpine Express show combines the time tested traditions of a German Oktoberfest with some of the most talented, colorful, and fun performers you will ever enjoy! They're fun; super musicians; and give you an upbeat show with lots of audience interaction. It's big entertainment that keeps a great tradition alive and gets people involved in the spirit of good fun and fellowship. I am a semi professional accordionist and my main musical interests are Midi Enhanced Accordion music from all genres. I perform mainly for charity events and local festivals, including all styles of international accordion music. I also enjoy arranging compositions to accordion, and have recently been performing at many churches and for Senior groups throughout Central Texas. My latest performances include renditions/arrangements of "Ghostriders in the Sky", "Variations on an Amazing Grace", "Beer Barrell Polka Variations", "Russian Minka Variations", and other favorites. My preferred instruments are a Titano Starlight Royal Cossoto Accordion with a Melody Maker onboard Midi Synthesizer, a Petosa Mahogony Alpine Tuba Bass Accordion, and sometimes….a Mirafone 189 Kaiser Tuba. In addition to the accordion, I am a Tubist, and combine accordion and tuba performances periodically. Currently, I live in Central Texas with my wife Darla, and our three children (Meredith, Lance, and Mitch). Periodically they perform also with me on Harp, Drums, and Bass, respectively. When performances include my children....we have been affectionately called " Mike and the MIDDLETONES ". I perform throughout the year in the Scott & White Clinic Cafeteria for Octoberfest, and sometimes for Valentine’s Day, Cinco de Mayo, and other venues. My friends, family, clinic staff, hospital staff, and patients continue to attend my performances. It is to them that I dedicate this webpage. gregory.patterson@gmail.com Founded in 1982 by Ed Swanzey and a dozen musicians for the Kingston 4th of July parade, The Hometown Band is a community band that serves Kitsap County (Washington) and surrounding areas in western Washington State. The Hometown Band strives to provide a friendly and supportive environment in which band members of varying skill levels can learn and enhance their musicianship while offering challenging performances that enrich the local community. Comprised solely of volunteer musicians our members include retirees, students, and people with a wide range of occupations all of whom share an interest in playing together and bringing music to the community. We perform an average of 20 concerts per year at local civic events, festivals and public gatherings. Our concert program encompasses a variety of musical genres. Summer audiences enjoy our traditional concert music, military marches, patriotic songs, with an occasional jazz or swing number thrown in for good measure. In the fall we roll out the barrels with lively polkas and Oktoberfest beer hall standards. Our winter performance season wraps up the year with Christmas carols and other holiday favorites. webmaster@altekameraden.com What began in 1942 as a group of friends who loved to play the music of their National origin has evolved into a renowned musical organization called "The Freistadt Alte Kameraden Band". Many of the band members are related to each other, brothers, grandfather, father, sons, uncles, cousins. Through marriage there are brother-laws and sons-in-law. The band is showing no signs of slowing down anytime soon. Two members Harold Pipkorn and Wilmer Wetzel, have played with the band since 1942. Harold Schoessow, Franklin Klug, Earl Hilgendorf and Don Silldorff are other long time members of what started out as the "The Victory Band". The Freistadt Alte Kameraden Band now in its seventh decade celebrates and shares the sound of traditional German music for all those that wish to listen. (262) 894-8356 Blaskapelle Milwaukee is your hometown source for authentic Blasmusik! We are one of the newest and youngest performing groups in Milwaukee and consists of 19 of the finest young musicians from around the midwest. Blaskapelle Milwaukee looks forward to playing for your oktoberfests, corporate parties, private parties, local parks, or even just for a great time with awesome music. We play in the European Blasmusik style modeling after the finest bands across Europe and the United States. Such groups include, but are not limited to, Dorf Kapelle, Blaskapelle Gloria, Blaskapelle Lublaska, Blaskapelle Makos, Blaskapelle Tschecharanka, and Ernst Mosch. oder hatten Sie schon Gelegenheit, uns live in Action zu erleben? Temperament, Publikumsnähe und die richtige Musik zur richtigen Zeit - das sind unsere Stärken. Mit unseren gaudigeladenen Nummern garantieren wir Superstimmung und Spaß bei allen Festlichkeiten. ...selbstverständlich alles live, verpackt in Animation, Show und gute Laune. Die Lasterbacher, das musikalische Highlight für Ihr Event ! YouTube Alles begann mit einem Demo-Band, das bei der Ariola auf dem Schreibtisch landete. Normalerweise sind die Erfolgsaussichten bei solchen unangeforderten Angeboten gering. Aber die Dorfrocker begeisterten mit ihren Ideen gleich alle Mitarbeiter, die am runden Tisch saßen: Kurze Zeit später hatten die Thomanns ihren ersten Vertrag in der Tasche! Sie waren in allen bekannten großen TV-Musikshows zu Gast, hatten insgesamt über 60 (!) TV-Auftritte, landeten im Spitzenfeld des Grand Prix der Volksmusik und gingen mit Florian Silbereisen auf Tournee. Ihre eigenen Live-Shows, die sie immer mit ihrer Live-Band bestreiten, sind legendär! Über 500 Auftritte seit 2007, alleine 140 in 2011, sprechen für sich – Tendenz steigend! Sogar schon nach Las Vegas hat es die drei Brüder verschlagen, um beim dortigen Oktoberfest den Amis einzuheizen. Die Dorfrocker vereinen E-Gitarre und Lederhose. Zu ihren Konzerten kommt das junge Party-Volk genauso wie der jung gebliebene Opa. Da ist es kaum verwunderlich, dass es mittlerweile sage und schreibe 30 Fanclubs der drei sympathischen Jungs gibt, und das nicht nur in Deutschland – sogar in der Schweiz und in Frankreich. Die ersten drei Alben „Party, Mädels... geile Zeit!“, „Jetzt geht‘s richtig ab“ und „Remmi Demmi“ lieferten Hits wie „Und ab geht die Lutzzzi“, „Mir san mir“ und schließlich den Chart-Breaker „Vogelbeerbaum“, mit dem die Dorfrocker Anfang des letzten Jahres einen Überraschungshammer landeten und sogar ihr Album „Remmi Demmi“ auf Platz 65 in die offiziellen Charts katapultierten. Die Erfolgskurve der Dorfrocker zeigt also eindeutig nach oben. Jetzt wollen sie mit dem Titelsong zum TV-Format „Die Alm“ noch einen drauf legen! Die neue Dorfrocker-Single „Auf der Alm“ ist ab 5. August als TV- und Party-Version im Handel und in allen Download-Shops erhältlich. Das Album „Alm-Alarm – Das Beste der Dorfrocker“ ist ab 19. August im Handel.